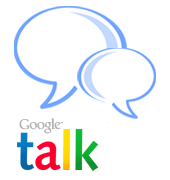 After my last post on GTalk (Google Talk) About the Shorcuts in Gtalk. After that day i started looking for a new stuff in Gtalk that how to show invisible or offline in Gtalk . Because it is very helpful when a person is very busy on the internet. 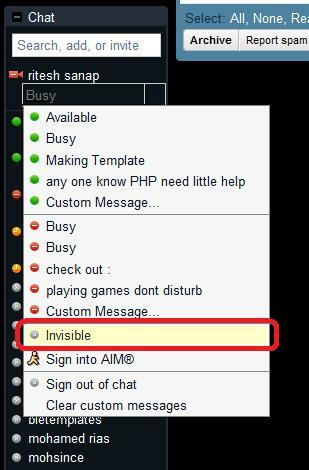 But to be invisible is easy if you are using the chat function that is in Gmail. Then go to the chat and click the down arrow beside the status bar. then go a bit down and you will see an word Invisible click on it. 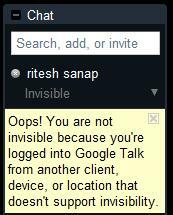 Note : If you are logged in with Gtalk That time it will show this error. 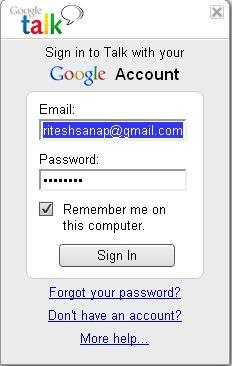 Then for this you have to sign out from Gtalk and have to chat from Gmail Chat. If you not like to chat from Gmail chat. then I have another Edition of Gtalk which you can use. Gtalk Labs Edition : this Edition of Gtalk has option of Invisible so you can use it . has an very good looking interface and has every good notification.